Here’s another post I wrote for the InfoSec Institute. What are the consequences for an enterprise if one of their branch routers is stolen? Read the article here – comments welcome! Avast, me hearties! When a swashbucklin’ pirate sights land whilst sailin’ uncharted waters, the first thing he be doin’ is makin’ a map. Ye can’t be burying ye treasure if ye don’t have a map, yarrr! For everyone’s sanity, the pirate speak ends now. Save it for TLAP day! When searching for booty on a network, it’s often useful to have a map. If you’ve got a foothold during a pentest, for example, how far does your conquered domain stretch? Is it a single-subnet site behind a SOHO router, or a tiny outpost of a corporate empire spanning several countries? To get the answer, the best thing to do is ask one of the locals. In this case, we’re going to try to convince a helpful router to give up the goods and tell us what the network looks like. The control plane within the enterprise’s routers contains the routing table, which is essentially a list of destination prefixes (i.e., IP networks) and the next-hop to be used to get there (i.e., which neighbouring router to pass traffic on to in order to reach a destination). The routing table is populated by a routing protocol (such as BGP, OSPF, EIGRP, RIP, etc), which may in turn have many internal tables and data structures of its own. Interior routing protocols (like OSPF) are concerned with finding the “best” route from A to B within the enterprise using a “technical” perspective; they’re concerned with automatically finding the “shortest” and “fastest” route, as opposed to exterior routing protocols like BGP which are more interested in implementing human-written traffic forwarding policies between different organisations. The key word above automatic. Interior routing protocols like to discover new neighbouring routers without intervention – it can therefore cater for failed routers that come back online, and allow the network to grow and have the “best” paths recomputed automatically. So, how are we going to get our treasure map so that we know how far we can explore? We’re going to call in Cap’n Quagga! 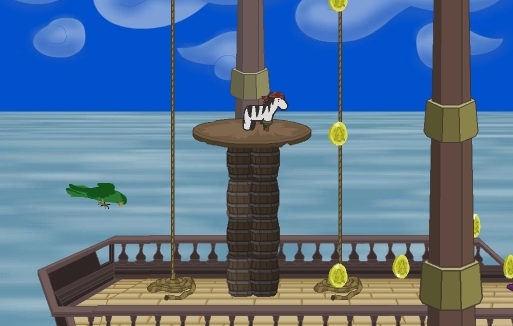 Pirate Cap'n Quagga aboard his ship, "Ye Stripy Scallywag"
Quagga is a software implementation of a handful of routing protocols. We’re going to use it to convince the local router that we’re a new member of the pirate fleet, upon which the router will form a neighbour relationship with us. After this has happened we’ll end up with our pirate treasure map, namely the enterprise’s routing table. Finally, we’ll look at ways in which the corporate privateers can detect Cap’n Quagga, and ways to prevent his buckle from swashing in the first place. For the purposes of this article we’re going to use OSPF, but the principles hold for other protocols too. OSPF is quite a beast, and full discussion of the protocol is well beyond the scope of this article – interested parties should pick up a book. As shown above, we need to turn on the zebra daemon too – ospfd can’t stand alone. Now we can force a restart of Quagga with ‘/etc/init.d/quagga restart’. For more information, the Quagga documentation is here, the wiki is here, and there’s a great tutorial here. OSPF does not ride inside TCP or UDP – it has its own IP Protocol number, 89. Ye're flying my colours, matey! For a text only environment, “tshark -i eth0 -f ‘ip proto 89’ -V” provides similar output. The Hello and Dead intervals of 10 and 40 are the defaults, which is why they don’t show in the running-config under ‘interface eth0’. Step Four – Start diggin’, matey! Firstly, we’ve got a few more subnets than merely the local one to enumerate with nmap etc! We can make some kind of estimation on how far away the subnets are by looking at the route metrics. An example above is the ‘1012’ part of ‘[110/1012]’. 1012 is the metric for the route, with the precise meaning of “metric” varying from routing protocol to routing protocol. In the case of OSPF, by default this is the sum of the interface costs between here and the destination, where the interface cost is derived from the interface’s speed. 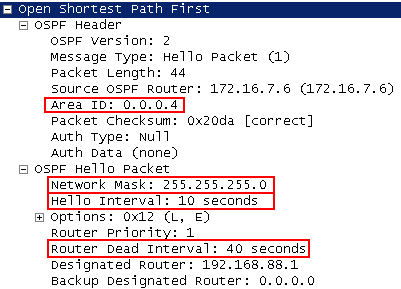 The 110 part denotes the OSPF protocol’s “administrative distance“, which is a measure of trustworthiness of a route offered for inclusion in the routing table by a given routing protocol. If two protocols offer the routing table exactly the same prefix (10.4.3.0/26, for example), the routing protocol with the lowest AD will “win”. A good number of these routes have a prefix length of /26 (i.e., a subnet mask of 255.255.255.192), meaning that they represent 64 IP addresses. These are likely to be host subnets with new victims on them. The /30 routes (4 IP addresses) are likely to be point-to-point links between routers or even WAN or VPN links between sites. The /32 routes (just one IP address) are going to be loopback addresses on individual routers. If you want to target infrastructure directly, these are the ones to go for. If you want to start digging really deeply, you can look at the OSPF database (show ip ospf database), but that’s waaay out of scope for now. Step Five – Prepare a broadside! If we’ve got to this point, we are in a position not only to conduct reconnaissance, but we could also start injecting routes into their routing table or manipulate the prefixes already present in an effort to redirect traffic to us (or to a blackhole). Originating a default route is always fun, since it will take precedence over legitimate static default routes that have been redistributed into OSPF (redistributed routes are “External” in OSPF terminology, and are less preferable to “internal” routes such as our fraudulent default). If we had a working default route of our own, this approach could potentially redirect Internet traffic for the entire enterprise through our Quagga node where we can capture it. Either that or you’ll bring the network to a screaming halt. Anyway, it’s all moot, since we’re nice pirates and would never consider doing anything like that! Privateers off the starboard bow, Cap’n! How can we detect such naughtiness, and even better, prevent it? Keeping track of adjacency changes is an excellent idea – it’s a metric of the stability of the network, and also offers clues when rogue devices form adjacencies. Stopping rogue adjacencies altogether can be accomplished in two ways. The first is to make OSPF interfaces on host-only subnets “passive“, which permits them to participate in OSPF without allowing adjacencies to form. The second method is to use OSPF authentication, whereby a hash of a preshared key is required before an adjacency can be established. Either method is strongly recommended! In part one, I covered how to use Cisco routers and firewalls to perform full packet capture. This exciting installment will cover how to get network session data out of these devices. 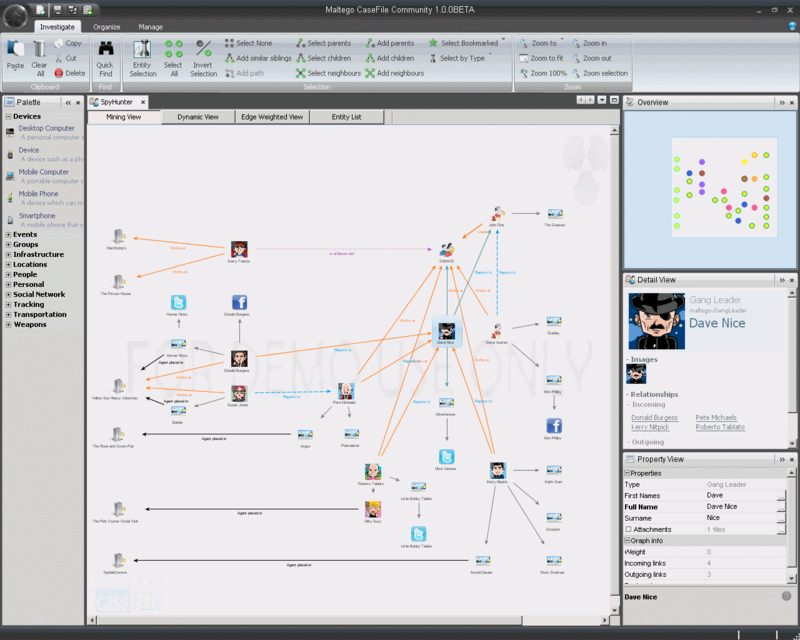 Network session data can be likened to a real-world itemised telephone bill. It tells you who “called” who, at what times, for how long, and how much was said (but not what was said). It’s an excellent lightweight way to see what’s going on armed only with a command prompt. There are several ways to extract such information from Cisco kit; we’ll look at each in turn, following Part One’s support/troubleshooting/IR scenario of accessing remote devices where you’re not able to make topological changes or install any extra software or hardware. The richest source of session information on Cisco devices is Netflow (I’ll leave it to Cisco to explain how to turn it on). If you’re able to set up a Netflow collector/analyser (like this one (free for two-interface routers), or many others) you can drill down into your session info as far as you like. If you haven’t got an analyser or you can’t install one in time of need, it’s still worth switching on Netflow because you can interrogate the flow cache from the command line. In absence of a graphical Netflow analyser, the Packets/Sec counter is a good barometer of what’s “using up all the bandwidth”. To clear the stats so that you can establish a baseline, you can use the command “clear ip flow stats”. So what’s yyy.yyy.yyy.yyy, then? It’s the NAT inside global address representing 10.4.1.3. As Netflow is unidirectional and is recorded as it enters an interface, the returning traffic from zzz.zzz.zzz.zzz will have the post-NAT yyy.yyy.yyy.yyy as its destination address, and will be recorded as such. Provided that you keep that lot in mind, the flow cache is a powerful tool to explore the traffic your router is handling. If you’ve got a worm on your network that’s desperately trying to spread, chances are you’ll see a ton of NAT translations (which could overwhelm a small router). Rather than paging through thousands of lines of output, you can just ask the device for some NAT statistics. On a router, it’s “show ip nat statistics”; on a PIX/ASA, it’s “show xlate count”. Keeping tabs on the number of active NAT translations is a worthwhile thing to do. I wrote a story for Security Monkey’s blog a while back which tells the tale of a worm exhausting a router’s memory with NAT translations; you can even graph the number of translations to look for anomalies over time. Another way of extracting session information is to ask the router or PIX about the sessions it is currently tracking for firewall purposes. On a router it’s “show ip inspect sessions [detail]”; on the PIX/ASA, it’s “show conn [detail]”. 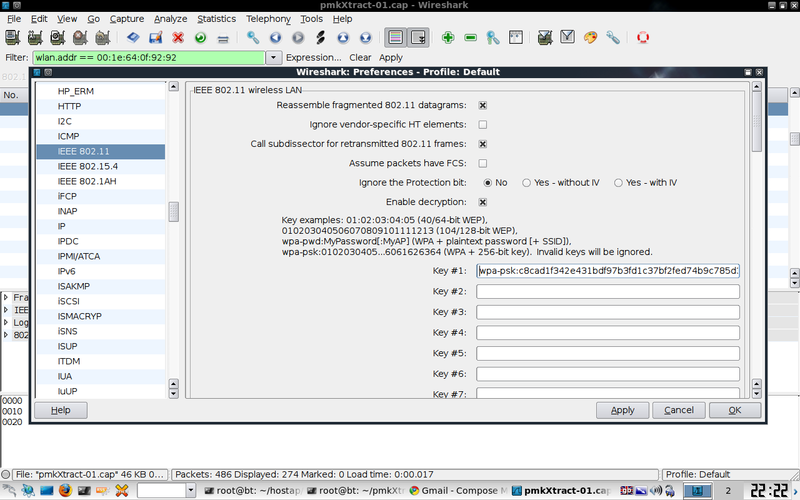 This has the advantage of not being complicated by NAT, but still showing useful bytecounts and session durations. The ip accounting command records the number of bytes (IP header and data) and packets switched through the system on a source and destination IP address basis. Only transit IP traffic is measured and only on an outbound basis; traffic generated by the router access server or terminating in this device is not included in the accounting statistics. Traffic coming from a remote site and transiting through a router is also recorded. If “ip accounting” was a last resort, “debug ip packet” is what you’d use as an even lasterer resort, so much so that I leave it as an exercise for the reader to find out all about it. Don’t blame me when your router chokes to the extent that you can’t even enter “undebug all”…!